NYC Educator: Goodbye Friedrichs, Whither UFT? Antonin Scalia is no more, and with him goes the Friedrichs case. Scalia was the wild card here who may actually have prevented free riders, said leadership. We will never know for sure. Now, worst case scenario appears four justices who are not insane will match the four who likely hate the idea of organized labor having a fighting chance. UFT leadership is already in the midst of its Union Loud and Proud campaign, which entailed handing out buttons at the DA and having CLs hand out smaller ones to a few people in their schools. I've done that, and it wasn't a bad idea. It just wasn't a complete idea. After all, the Unity Caucus still dictates absolutely everything that happens. In their last DA handout, they declared that Unity Caucus is UFT. While that's hubris, it's not far from the truth. And therein lies the problem. Unity itself declares that its elite membership is UFT, even as it shuts out all grassroots voices. It sees no problem, and in a way there isn't. After all, they can do whatever they want at the DA. When independent voices become too troublesome, Mulgrew can blather on and make sure anything inconvenient never hits the floor. If it does, Leroy Barr can get up and oppose it, and every Unity CL will vote against it or lose that all-important trip to Schenectady, along with the attendant crème brûlée at the hotel. If you've been reading this blog for any amount of time, you know that Unity is an elite, invitation only group that demands a loyalty oath of all its members. Personally, I would not find this so objectionable if it took positions that reflected the interests of working teachers. Instead, it's enabled the ATR, mayoral control, junk science teacher rating, and actually thanked the Heavy Hearts Assembly for making it worse. How can a day to day working teacher rationalize such nonsense? Perhaps worst of all, it's marginalized those of us who actually teach NYC children. Nowhere is this more evident than in the fact that fewer than 20% of working teachers deem it worth their time to vote in union elections. While I vote every chance I get, I certainly understand the indifference, frustration and cynicism that moves members not to bother. The mode of election, an envelope in a mailbox, is far from my first choice of communication. We'd certainly get a better turnout if it were done in school buildings, and retirees would not likely overwhelm working teachers in such a scenario. Alas, such are the disadvantages of blatantly rigged elections. While Friedrichs will pass, for now, the underlying issue will not. Do you think the police or firefighters were worried about Friedrichs? I don't. They know they are brothers and sisters. They have one another's backs. They understand what union is. It's second nature. It's when we look out for one another. Our union leadership is a cabal, closed off to rank and file. Most rank and file don't even know what the Unity caucus is, and indeed I didn't know much about it until I started questioning the abysmal 2005 contract. We've just got this vague notion that the odds are stacked against us, and that we're wearing targets on our backs. It may or may not be as well known that our leadership, far from actually fighting those who'd hurt us, get excited only when the establishment is challenged. Still, anyone with access to the Daily News has to wonder why Michael Mulgrew would get all punchy over Common Core opponents. Where the hell was he while we went all those years without a contract, even as NYPD and FDNY had one? Why is it a great victory for us to wait until 2020 for the money they had in 2009? And worse, why are UFT teachers so beaten down they could envision no better alternative? It's gonna take quite a lot for teachers to have the camaraderie our brothers and sisters enjoy. It's gonna take a new awareness, a sea change. UFT Unity can barely conceive of such a thing, let alone execute it. 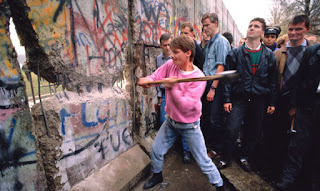 Take down that wall, Mr. Mulgrew. Because if you don't, it has to fall one way or another.